There are many details to think about when planning a wedding—a few of which may not be top-of-mind when first thinking about costs. The table linens are one example. Buying them at full cost can be a surprise blow to the low-cost wedding budget, but that need not be the case. We are all familiar with table clothes. Floor length (or even longer) generally results in a more formal look, while shorter versions are less formal and more economical. Overlays are generally square pieces of material placed over round tables, providing contrast to the longer table clothes. Runners, sometimes used sans cloth, provide the same function as the overlays, but are strips of fabric that are most often seen on rectangular tables. Floor-length skirts attach with clips around the perimeter of an already-covered table. 1. Rent the table linens. While this will not likely be your least costly approach, it is a way to get more upscale coverings for less and save time in the process—an attractive option for an intimate wedding. You will no doubt be able to find local rentals in addition to the online companies that send and accept returns via mail. 2. 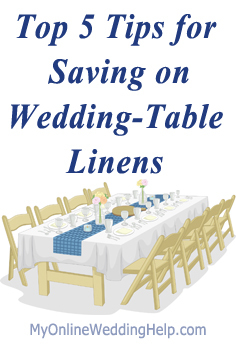 Use linens available through your venue. Sometimes your rental will include the table coverings. If so, ask to see them so you know what to expect, and verify whether there is an additional cost. If you are pleased with both, you need not source them separately. – Organza is a sheer, silky-textured fabric. – Satin is also silky smooth, but typically opaque. – Taffeta generally has a slight silky sheen but is crisper than either organza or satin. – Burlap, stiffer and rougher than typical coverings, is the “poster child” for rustic wedding fabric. The above is an excerpt from the Dream Wedding on a Dime; 7 Secrets for the Budget-Savvy Bride ebook.